Caribbean cooking is all about using the freshest ingredients possible. We have been living the quintessential farm to table lifestyle decades before the term was coined. The typical market is made up of local farmers who sell vegetables straight from their gardens, seafood plucked from the ocean a few short hours before and if you’re adventurous you can even buy livestock. As a young child living in Guyana I looked forward to Saturday mornings spent at Stabroek Market with my parents. We would meander through the stalls, stopping at the vendors with the best produce; one thing’s for sure it would always be fresh. My least favorite part of the market was the fish section for obvious reasons. Imagine the furthest section of the market, way in the back, pass the stalls selling gold, spices and wood carvings…that’s where you would find the fish section. It was strategically placed in the back because Stabroek Market was located on the bank of the Demarara River and it was easily accessible to the fishermen who brought in their days catch. It was simple…straight from the boat to the vendors located just a few feet away. I disliked the moisture and fish parts that would sometimes gather on the floor but was also excited at the prospect of having fresh snapper or shrimp for lunch later that day. After my father skillfully picked what he determined was the best fish, we would wrap up our days excursion and make our way home, but not before stopping to snack on a snow cone drenched with condensed milk. Once at home, cleaning of the fish would commence and the makings of a fresh Caribbean lunch would be on the way. Those days are long gone but Twenty years later and my Saturdays are pretty much the same. I usually go to the Farmer’s Market on Saturday mornings seeking the freshest produce available. My snow cone is now replaced with a lemon bar. My seafood is no longer still alive when I purchase it but I’m a realist. I no longer live in the Land of Many Waters, no longer a few miles from the Atlantic Ocean but in Atlanta so I make do with what’s available. On my last Saturday excursion I picked up a couple of pounds of duck thighs and shrimp with the intention of making curry. Why two curries? Because as a Guyanese it is my right to curry everything and anything possible and I chose to exercise my rights. 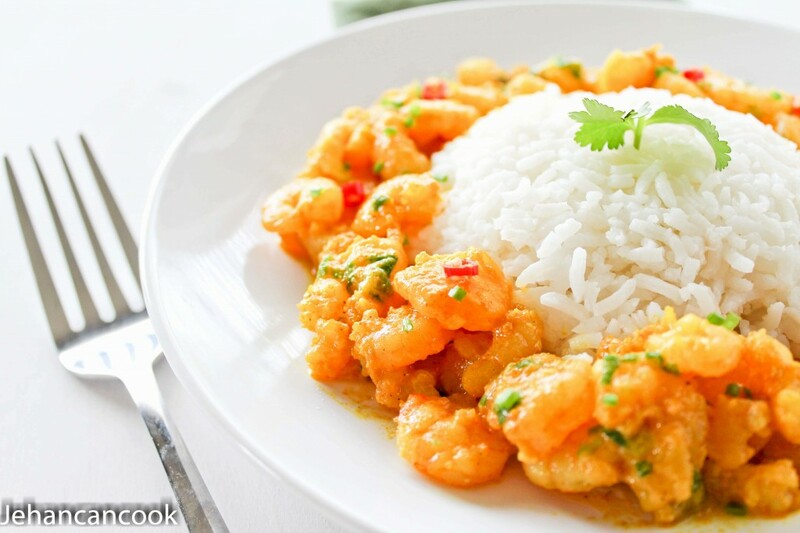 Guyanese typically make fish or shrimp curry with a piece of mango added to give it a distinct flavor. While tasty, I wanted something different. I added less curry powder than I usually would and added lots of ginger and coconut milk and was pleased with the results. My in-laws visited on Saturday and gleefully devoured the curry. I think I can call it a success. 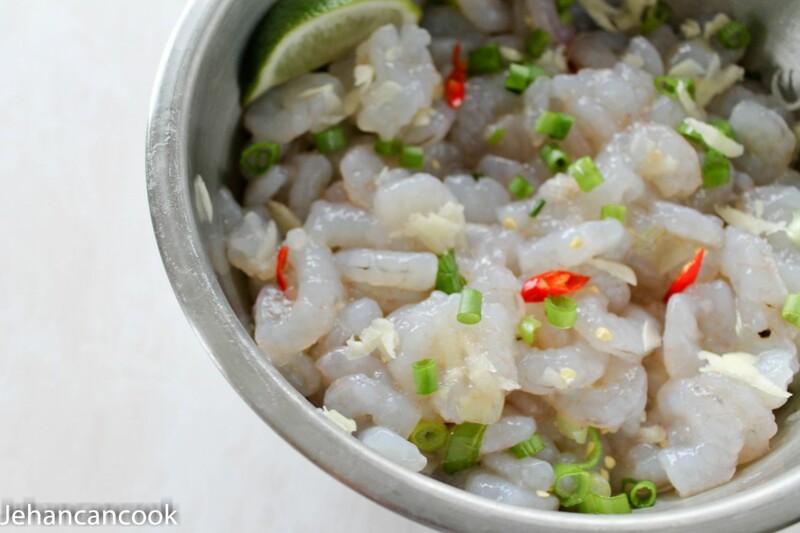 Place cleaned shrimp in a bowl with enough water to cover and juice of ½ lime. Allow to sit for 10 minutes; rinse. Add scallion, pepper, garlic and salt to shrimp; mix. Set aside for 15 minutes. While the shrimp marinates, add canola oil to a deep frying pan over medium heat. 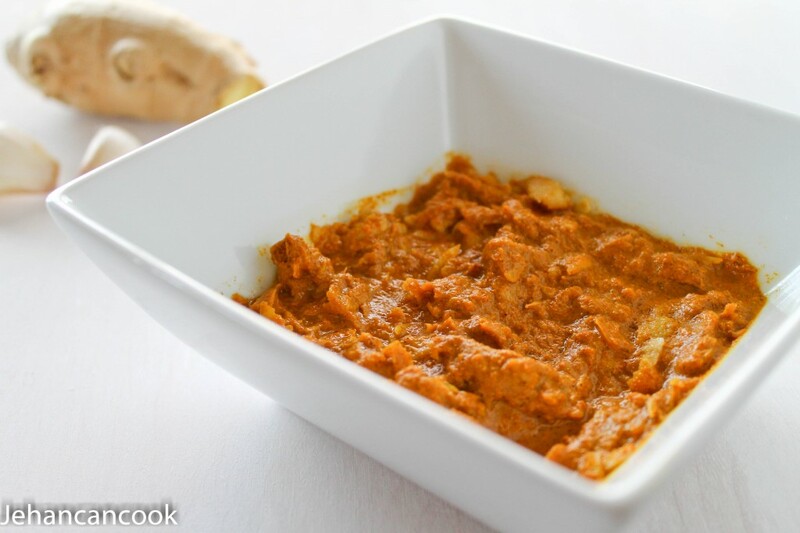 In a small bowl add curry powder, cumin, crushed ginger, garlic and water to form a paste. When the oil is hot, add curry paste. 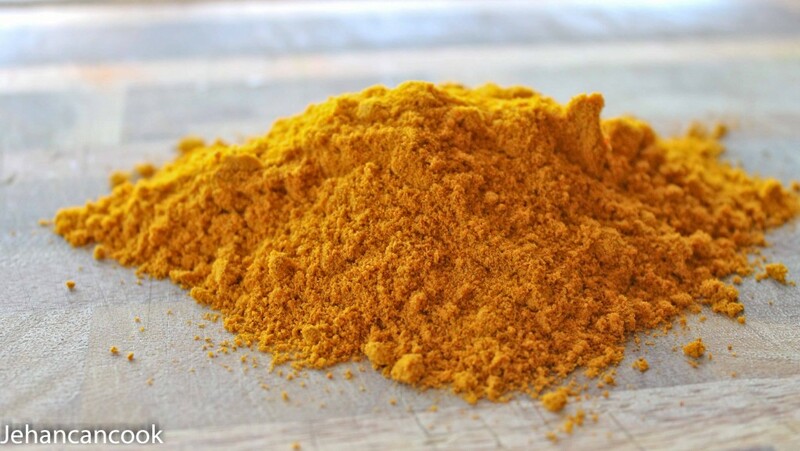 Cook curry for 5 minutes, stirring frequently to prevent burns. 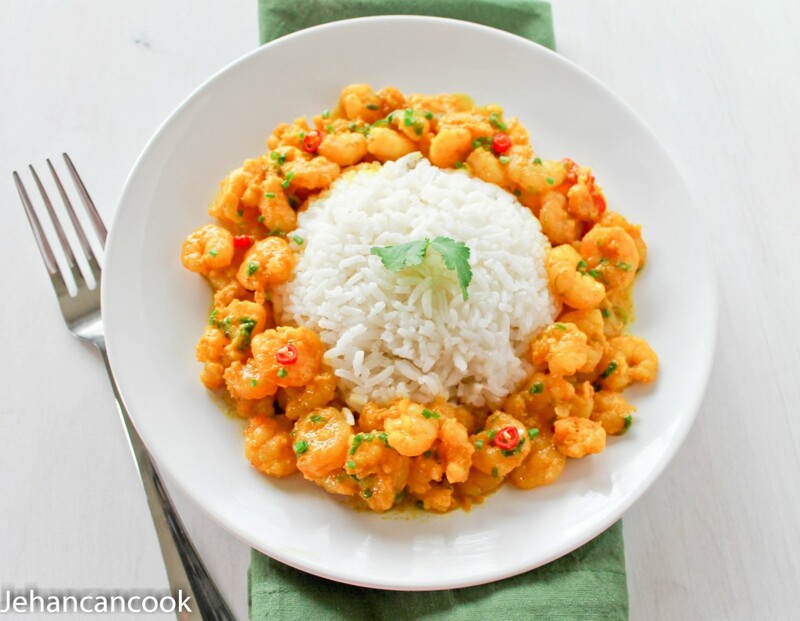 Add Shrimp to curry and stir-fry for 3-5 mins. Add coconut milk and ketchup and cook for an additional 5 minutes. Remove from heat and garnish with additional scallion. Serve over rice or with roti! If the sauce is too thin, remove the shrimp from the sauce with a slotted spoon and set aside. Cook the sauce until it reduces, for an additional 5 minutes. Once the sauce has reduced, add the shrimp back to the sauce. Removing the shrimp prevents overcooking it. Nobody likes rubbery shrimp! Girl you have brought back memories of Beautiful Guyana, I do remember those Saturdays market day. The curries look wonderful. Your posts take me straight back to Guyana. On a sidenote, Georgia is has a coastline. Oops..I do know that we are on the coast, what I meant was land locked Atlanta .. I have just tried this recipe and loved it! Welcome my neighbor to the south. Glad you enjoyed it Mary. Omg I love cooking curry. This brought back alot of memories with me and my grandmother growing up in Guyana as a little, girl. Your recipe rocks love it. Keep up the good work.